VATICAN CITY (AP) — Pope Francis celebrated an active if low-key 80th birthday on Saturday, sharing breakfast with eight homeless people before celebrating Mass with cardinals as greetings poured in from around the world. The pontiff received more than 70,000 email messages wishing him a happy birthday, as well as telephone calls and telegrams from world leaders and religious figures. His predecessor, 89-year-old Emeritus Pope Benedict XVI, sent a "very affectionate" written greeting that the Vatican said was "particularly appreciated," followed by a personal call in the afternoon and three small gifts that the bore "very personal and significant meaning for both." The Vatican did not otherwise divulge the nature of the gifts. 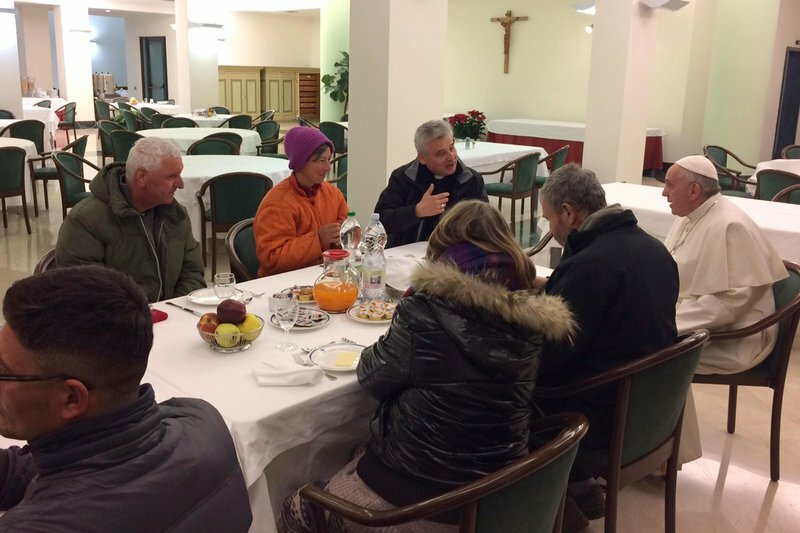 At breakfast, Francis chatted individually with each of the homeless guests— four Italians, two Romanians, a Moldovan and a Peruvian — at the Vatican hotel where he resides, and shared Argentinian cakes with them before heading to Mass. The guests offered the pope a bouquet of sunflowers. They were invited from among those staying around St. Peter's Square and at nearby showers for the homeless established by the pope's almsgiver. The pope also sent enough birthday cakes for 1,500 people to kitchens serving the poor and homeless in Rome. Speaking to the cardinals, Francis contemplated the aging process. "For some days now, I have had in mind a word that seems ugly: Old age, a thought that frightens," he said. But then he recalled his own words during his first papal greeting in 2013, when he said: "Old age is the thirst for knowledge." He added: "I hope it will be the same for me." Saturday is a working day at the Vatican and Francis kept up his usual pace. He met with Malta's president and held an audience with members of the Nomadelfia community, a secular group whose lifestyle emulates early Christians, who sang "Happy Birthday" to the pontiff. The pope experienced the day "with great joy. He was particularly happy by the presence of many children and youths at the audience with the Nomadelfia community," the Vatican said. Greetings arrived from all corners of the globe, both personal messages and succinct tweets with the hashtag #Pontifex80. U.S. President Barack Obama said Francis "has inspired people around the world with his message of compassion, hope and peace," while Italian President Sergio Mattarella recalled that the pope has called on Europeans to show solidarity with the less fortunate, in particular "migrants and all those who live at society's margins." Russian President Vladimir Putin sent Francis a telegram and followed it up with a phone call in which he "remarked on the big contribution he has personally made to strengthen ties between Russia and the Vatican, which moved to a significantly new level in the recent years," the Kremlin said. The Kremlin said Putin and the pope "exchanged opinions" on the plight of Christians caught in armed conflicts around the world and the importance of an interfaith dialogue. Earlier this year, Francis met with Russian Patriarch Kirill in the first meeting of the head of the Roman Catholic Church and the leader of the world's largest Orthodox Christian flock. The patriarch's office said Saturday that Kirill had sent a congratulatory message to Francis and lauded him for improving ties between the Russian Church and the Vatican. Or can tweet your birthday messages using the hashtag #Pontifex80.